Why charities and corporate sponsors are a perfect match! Partnerships between businesses and charities are a perfect match because both the charity and the company benefit in equal measure and it’s a great way of strengthening existing relationships. Corporate sponsorship is not just about the charity benefiting financially – Isabel Hospice are dedicated to working in partnership with charity partners to help them meet their corporate social responsibility objectives and add value to their brand. Rather than simply making a donation, event sponsorship in particular provides opportunities for staff to get involved and volunteer at the fundraising event which is a great way of ‘giving back’ to the local community and in turn boosts the businesses team morale. Isabel Hospice events attract thousands of people in eastern Hertfordshire every year and certain events appeal to a specific demographics. If a company is spending their marketing budget on expensive adverts to communicate to the same audience then they should consider incorporating charity sponsorship into their strategy. The Isabel Hospice Bubble Rush 5k at Cheshunt Park on 16th July was possible due to a number of corporate sponsors, including Cariad Marketing in Hertford, Connect Scaffold in Bishop’s Stortford, Wilkins Kennedy in Hertford, AMP and Paypoint in Welwyn Garden City, Mowers Food Service, Volker Wessels and DW Windsor who are all based in Hoddesdon and Austin’s Family Funeral Directors. 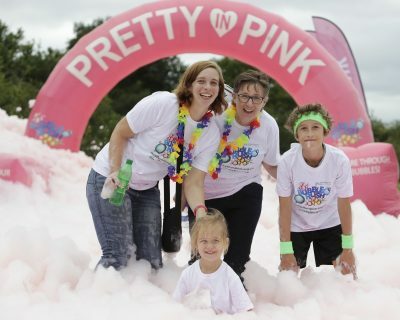 Beth Hardy, Mass Events Manager at Isabel Hospice said “Putting on a big mass participation event like the Bubble Rush 5k where we had over 1,000 participants is a big job for a small charity like ourselves. We had upfront costs to pay before we can actually start fundraising and the support of local businesses with their sponsorship has been invaluable. They made a donation to the event, enabling us to secure the franchise for this popular fundraiser and are also helping in other ways including putting in teams and volunteering staff for the running of the day, help fund t-shirts and bottles of water. In return for their sponsorship we put their logos on our marketing material, promote them on our social media channels and work in partnership with them on a long term basis. What we like about this business partnership is that it is so much more than a one off monetary donation. If you would like to find out more about becoming an Isabel Hospice charity partner, call Fundraising on 01707 382500, you will definitely get more out of it than you give! Want to take part in BubbleRush on 22nd July 2018? Email beth.hardy@isabelhospice.org.uk to register your interest!